There’s an old saying that beautiful lawns are made in the fall. Most of us don’t think about our lawns until spring, but fall is the most crucial time to act if you want to have a beautiful lawn the following spring. Aeration, over-seed and fall fertilization is recognized by lawn experts as the best treatment to control thatch, establish new lawns, fill-in bare spots, increase the effectiveness of fertilizer, and revitalize growth. It is critical to aerate and seed your lawn late summer to early fall as germination and subsequent growth slows as temperatures cool. Our skilled, licensed lawn techs use the highest quality seed, fertilizer and equipment to aerate your lawn, resulting in a more lush & healthy lawn making your yard the envy of your neighborhood. Did your lawn have bare patches this summer? If your lawn has bare patches that need seeding or if you’re creating a new lawn, autumn is the best time. 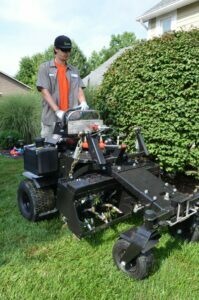 The most important lawn-care tasks that should be considered each fall are aeration, over-seed, and fall fertilization. Core aeration provides passages for air, water, and nutrients to reach the root zone of the grass plants. 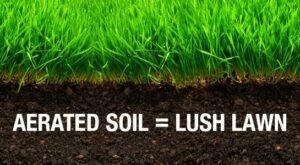 It also brings soil cores to the surface, which increases microbial activity, reducing the thatch layer. Core aeration is one in the fall to all accessible turf areas as germination and growth slows as temperatures cool and the days get shorter. It is critical to aerate and seed in the fall for beautiful lawns in the spring. Waiting to aerate and seed your lawn in the spring prohibits use of any pre-emergent products resulting in a lawn full of weeds. Stay ahead of the weeds next year by aerating and over-seeding in the fall. There are many reasons one would need or want Over-Seed: athletic fields, lawns that never recovered from the severe weather this summer, compacted soil, thin lawns, lawns attacked by insects or fungus, planting a new lawn, and the list goes on. The major benefit of over-seeding is it provides direct the soil for the seed to germinate. With our over-seed service, we also recommend a fall fertilization treatment. The goal is to feed the plant longer than usual to further develop the plant and its roots. Fall fertilization is the most important treatment of the year. Fertilizing in the fall helps your lawn grow stronger roots, giving it a base to come back in the spring and thrive. It also helps minimize the damage that Central Indiana winters and disease can have on your grass. Most importantly, fertilizer provides a source of energy for the roots and will help with spring green up, which will help you enjoy a greener lawn sooner. Many people think they can save money by skipping fertilizing this fall, but in the end it could cost them more to repair damage done by weeds. Something is going to grow there, and we’d rather it be healthy, good standing turf, than weeds. Once you have weeds, you have to constantly be battling with herbicides and weed control. When you fertilize your lawn in the fall, your lawn is going to reap the benefits next spring. GreenLawn by Design’s job is to make certain that your lawn has the best possible advantage going into the winter season. Have a lush, green lawn next spring by scheduling your aeration, over-seed and fall fertilization. Want to save some $ – Schedule 3 or more neighbors on the same day and each receives a 15% neighborhood discount. All services are guaranteed to your satisfaction. As a Veteran-Owned and operated company, we embrace the values that are important to you and our community. We guarantee our services and stand behind the work we do. We promise to you that we WILL; give the attention to detail your project deserves, always show respect to you and your family, produce clean efficient work, and place the needs of your yard first. It may be your yard, but it’s our mission.